HE HOUSE: a typical building in the traditional architectural style of Extremadura. Initially, the house was in a dreadful state, condemned to an uncertain destiny. However, with many hours of work and following a thorough renovation process, which focused on preserving the charm of the original building through the use of typical local materials (adobe, wood, slate and stone), it has been converted into comfortable and welcoming rural accommodation, which has been awarded the HIGHEST CATEGORY OF 3 HOLM OAKS by the regional government of Extremadura. Through the renovation, the aim has been to RESPECT the legacy of our predecessors, as we believe it to be the basis for our future. This house has 4 en-suite double rooms, distributed over two floors, each with a TV, air-conditioning and heating. The large room used as a lounge-diner-kitchen is spacious and very welcoming thanks to the fireplace. Another of the rooms is used as a library and games room. A space which especially attracts your attention is the garden, which is for the exclusive use of the tenants. Ideal for groups or families with children. It can be used to gain access to the house and is ideal for beginning the day with a good breakfast as you admire Arrago valley, or for sampling a delicious grill on the barbecue. The house wouldn't be complete without a typical cellar +dug out of the rock in the basement, a feature which is very common in this area where genuine “Pitarra” wine is matured. This is a must-see for all guests of the house to share a glass of wine served with a snack. To cater for the demand (requirements) of its loyal customers, L Menguante has increased what it has to offer guests with 4 apartments. 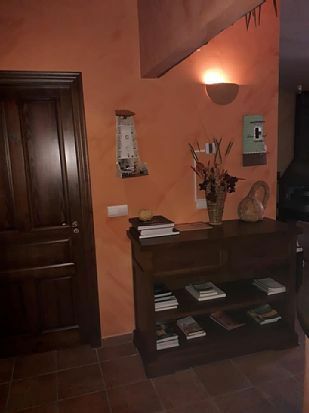 This accommodation, although recently built and within the town centre, consists of apartments with a rural style where accessibility and services with all the relevant extras are on offer, as they are equipped with facilities to guarantee a good stay with perfect climate control in both summer and winter. Each one is different and unique, with only the high level of comfort in common: wood-fired stoves, air-conditioning, hydromassage showers, Nordic sheets, 150 cm beds with viscoelastic mattresses, jacuzzi, candles, fruit basket and a bottle of cava are just some of the features included. We guarantee unforgettable experiences for those who enjoy special moments in our accommodation or for those who want to surprise their partner finding freedom in privacy. As an annex to the apartments, but sufficiently separate as to avoid disturbing the guests, is the reception and an “exclusive” restaurant (not open to the public) for people who stay the night in our accommodation. The cookery style is traditional, based on seasonal produce. We prepare menus for vegetarians, diabetics, people who are lactose intolerant, GLUTEN free, etc. If you request in advance we will prepare different menus: stews, rices, etc.